St. Philip’s In The Hills Episcopal Church was founded in 1936. When the first service was held on Christmas Eve, the congregation overflowed the seating capacity. St. Philip’s was built in Spanish Colonial architecture, similar to the Franciscan mission churches built in California over 400 years ago. 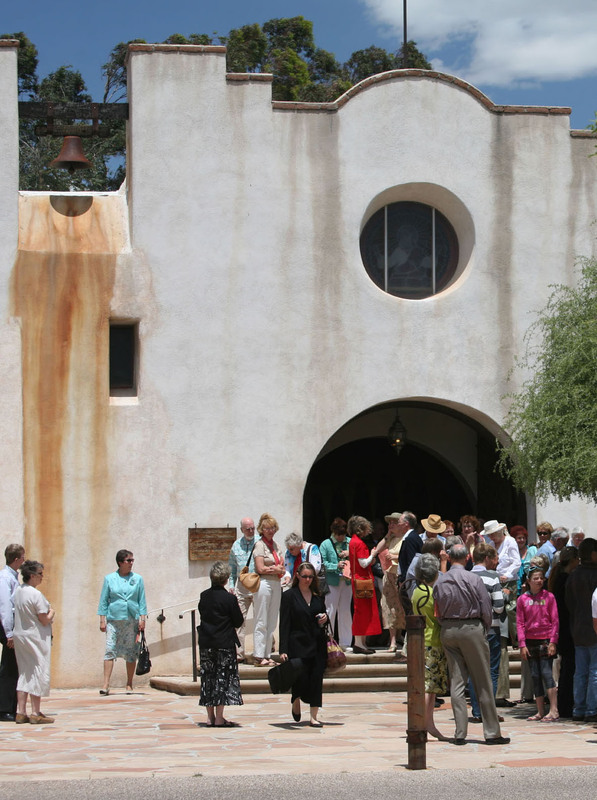 Tucsonans John and Helen Murphey had asked architect Josias Joesler to build a private chapel for them at their home. Instead, he persuaded them to build a small church at the corner of two dirt roads: Campbell and River. This was also a dream of the Rev’d George Ferguson, who was a temporary supply minister in Tucson. He envisioned a place where beauty dwelt, where the glory of God was exemplified, and where learning (for children, youth, and adults) was an ever-present part of people’s lives. Much of the art in the Church belongs to the Samuel H. Kress Foundation and is housed at St. Philip’s. Because it was created originally for religious spaces it is especially fitting that it be used in a sacred space. Although it has undergone several expansions as the congregation grew, the integrity of Joesler’s design has been maintained in the buildings. In the mid-1980s, an art gallery, a memorial garden, the east and west transepts and a campanile, which houses the carillon, were added. During the summer of 1998, a Children’s Center and Recital Hall were built. In 2005, the Church was added to the National Register of Historic Places. Today St. Philip’s is a large, active parish known not only for its worship, music, and art, but also for its inclusiveness, its educational programs, and its outreach to the community. More information about St. Philip’s, including a downloadable walking tour brochure, can be found here (scroll down for the link to the brochure). More information can be found in “Diamond Jubilee, 1936-2011.” This book in St. Philip’s library and in the Little Shop, updates the history of our church. It was edited by Nina Bell Allen-Langley, heading the writing staff of: Mary Ellen Barnes, Wayne Fulton, Dean Nelson, and Howard Gabbert.